Communication: Bluetooth, WIFI, 24L01, SPI, Infrared receiver, CH340 port. 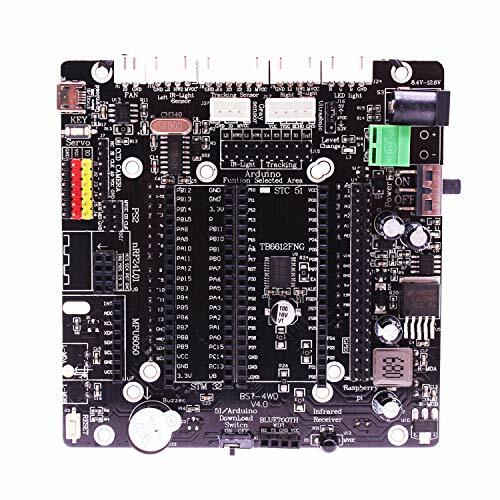 4WD expansion board*1【Compatible with 4 Controllers】This is a powerful expansion board that is compatible with 4 major controllers: Arduino, Raspberry Pi, STM32 and 51 controller. Meeting your every need for a robotic car, it can ensure that the onboard module resources are not affected after switching any version of the controller, and the sensor interface is compatible. 【Extension Board Equipped with A Wide Range of Sensor Interfaces】Such as ultrasonic obstacle avoidance, 2-channel infrared obstacle avoidance, 2-channel light-seeking, 4-channel tracking, RGB lights, color recognition, MPU6050 gyroscope and linear CCD camera. Compared to the traditional open IO port and DuPont line connection, we use a simple and easy to operate modular design and socket cable connection. It is easier and simpler to make the wiring not rough. 【Stable Power Supply System】Shield with 9.6V-16V wide voltage input, the voltage is lower than 9.6V, and the over-discharge protection circuit automatically cuts off the power to protect the battery. In addition, the breakout board also has a 12.6V charging interface, 3.3V/5V voltage switching, reverse connection protection, voltage monitoring circuit, forced reset circuit, low voltage prompt and stalled restart circuit to provide a stable power supply system. 【Communication & Control Methods】Expansion board support 6 kinds of communication methods: Bluetooth interface, WiFi module interface, 24L01 wireless interface, SPI communication interface, infrared receiving (integrated) and CH340 serial circuit (integrated).Expansion board also support 5 kinds of control methods: mobile APP, PC computer, PS2 controller, infrared remote control and gesture armband. 【Strong Motor Drive Capability】3 motor drive capabilities, including 4-channel DC motor interface, 6-channel servo interface and fire-extinguishing fan interface.Come with detailed tutorial links,we provide the best quality products, please contact us by amazon@yahboom.com if you have any difficulties.